In the 1930s, a young Bronx native moves to Hollywood, where he falls in love with the secretary of his powerful uncle, an agent to the stars. Now in his 80s, Woody Allen continues to crank out a new movie every year. For his 2016 release, we find Café Society. Set in Hollywood circa the 1930s, young Bobby Dorfman (Jesse Eisenberg) decides to leave New York and move to California. There he takes on a job with his uncle, talent agent Phil Stern (Steve Carell). This leads Bobby to meet Veronica "Vonnie" Sybil (Kristen Stewart), Phil’s secretary. Bobby immediately finds himself smitten with Vonnie, but she rebuffs his advances. Vonnie claims to have a boyfriend named “Doug” – but it turns out instead that she maintains an affair with her married boss Phil. The film follows these interlocking relationships. As love triangle tales go, Society offers an awfully dull experience. While the interactions among the characters should boast drama and intrigue, nothing eventful or interesting ever emerges. Instead, we find ourselves stuck with a dull, monotonous narrative. Bobby exists as nothing more than yet another “surrogate Woody”, a factor that leaves him as a one-dimensional personality. Allen doesn’t seem able to write for his doppelgangers in a satisfying manner any longer, so we’re left with a character who feels like a bland photocopy. It doesn’t help that Eisenberg fails to bring anything more than banal impersonation to the table. On paper, Eisenberg seems like a good candidate to play a faux Woody, as he naturally gravitates toward Allen’s style of awkwardness and stammering. To be sure, Eisenberg doesn’t flop in the part – he certainly beats some of the lousier surrogate Woodys from the past – but he lacks qualities beyond simple imitation. He gives us a performance without real substance. Carell probably fares best of the bunch, but he gets little with which to work, and the same goes for the rest of the cast. Society gives us a slew of indistinct characters who never seem endearing, interesting and intriguing. The film’s story goes nowhere. Allen seems to lack the patience to follow various paths, so Society flits around without much coherence. It seems to choose its direction almost randomly and doesn’t come together in any way. 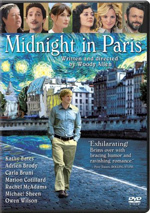 Allen shows no confidence in the movie’s basic romantic narrative. Society devotes a lot of time to a subplot about Bobby’s gangster brother Ben (Corey Stoll), and these moments make no real sense. The film could lose the Ben scenes entirely and no one would ever miss them. Deep down, though, the film’s biggest problem comes from its basic dullness. With lackluster characters and a meandering story, Café Society ends up as bland, boring Woody Allen material. Café Society appears in an aspect ratio of approximately 1.85:1 on this Blu-ray Disc. This was a strong presentation. Sharpness looked terrific. Virtually no signs of softness emerged, so the movie seemed tight and well-defined. No concerns with jagged edges or shimmering occurred, and edge enhancement remained absent. Source flaws also failed to create problems. Et tu, Woodman? Café heavily embraced Hollywood Standard orange and teal. Within those parameters, the colors appeared clear and concise. Blacks were deep and firm, while shadows showed good delineation. All of this left us with a great transfer. One shouldn’t expect much from the movie’s DTS-HD MA 5.1 soundscape, as it remained decidedly low-key. Though the mix expanded past Allen’s old mono days, it still seemed modest in scope. Music showed good stereo imaging, and effects used the side and rear speakers in a gentle manner. Not much occurred in this regard, though, so the mix seemed rather restricted – even potentially active scenes like those at parties or restaurants lacked scope. Audio quality was fine. Speech sounded natural and distinctive, without edginess or other issues. Music sounded peppy and warm. Effects had little to do but were clean and accurate. This was an acceptable track and no more. The Blu-ray includes minor extras. The two-minute, 13-second On the Red Carpet takes us to the movie’s premiere and includes comments from actors Blake Lively, Kristen Stewart and Parker Posey. We also see some photos from the shoot. It’s a promo piece without any substance. In addition, a Photo Gallery appears. It brings us 34 photos from the set and from the movie. This turns into a decent compilation. 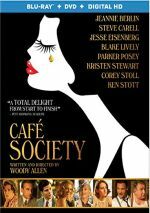 Nothing about Café Society makes it stand out in the Woody Allen catalog. The story and characters both seem lackluster, so the film musters little entertainment value. The Blu-ray boasts excellent visuals along with adequate audio and negligible bonus materials. Café Society delivers forgettable Woody.